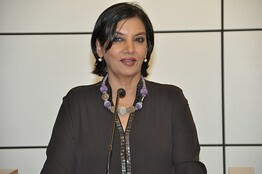 Actor Shabana Azmi, left, with Pat Kaufman, executive director of the New York State Governor’s Office for Motion Picture and Television Development. 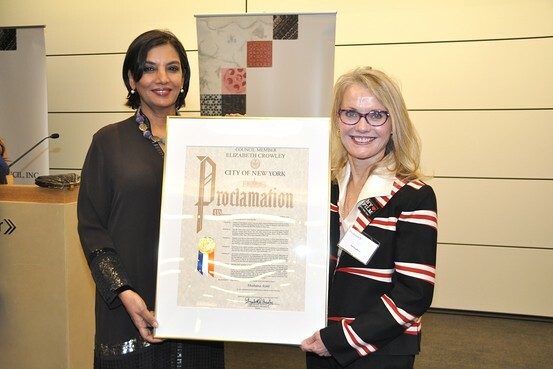 No stranger to blazing a multitude of cinematic and social trails, Shabana Azmi became the first Indian actor to receive a proclamation from the state of New York last week. Ms. Azmi, 61, was awarded the honor for her contribution and commitment to the Big Apple’s film industry, largely fueled by her involvement with the Indo-American Arts Council and its annual New York Indian Film Festival, now in its 12th year. “I feel very heartened because obviously, the festival has been a pioneer in its field,” Ms. Azmi told India Real Time. Come May, NYIFF will showcase a line-up of over 50 films including the Oscar-winning short documentary, Saving Face and a three-part Shyam Benegal Retrospective. Throughout her versatile career, Ms. Azmi has taken on a plethora of memorable characters and has won five National Awards. The same could be said of Ms. Azmi. Throughout her versatile career, the actress has taken on a plethora of memorable characters, ranging from an estranged housewife in “Arth” (1982) to an unlikely mafia heavyweight in “Godmother” (1999), earning five National Awards in the process. Up ahead, she’ll star in “The Reluctant Fundamentalist,” director Mira Nair’s adaptation of the best-selling novel by Pakistani author Mohsin Hamid. Ms. Azmi has been cast as the mother of Changez, a troubled, young Pakistani man who flees America to return to his homeland after the September 11 attacks. Fusing art with activism is practically second nature for Ms. Azmi, a former member of Parliament and a campaigner for the rights of slum-dwellers. When asked whether the younger generation of Indian actors displays a similar sense of social responsibility, Ms. Azmi stated that while “it might not be full-fledged,” artists are becoming increasingly aware of their positions of privilege. She singled out actor and producer Aamir Khan, who continues to fund socially-conscious films like “Peepli Live” (2010), centered on farmer suicides.